- COMPLETE SET OF FLAGS: Get the complete football flag set including goal-line cones, flags with Hook & Loop attachment closures, flag football belts and a bag to put them all in for convenient storage and portability. 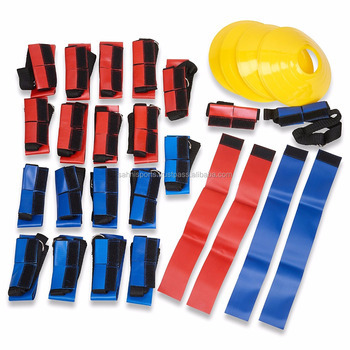 - DURABLE FOOTBALL EQUIPMENT: The flag football equipment is made from durable nylon material with metallic D-ring closures on the flag football belts and sturdy grips to ensure that the equipment can withstand vigorous play and can last for a long time. - UNIVERSALLY COMPATIBLE: The Unlimited Potential flag football belts can be adjusted to fit people from the age of 7 years old and above thanks to its universally fitting design. This allows the whole family to get in on the action and enjoy some wholesome quality time. - ENJOY REALISTIC GAME PLAY: With the accompanying set of flag football rules and all the necessary equipment, anyone can enjoy hours of quality, realistic fun with the Unlimited Potential complete set of flags for flag football.